The Striker Titan is the front line of defence and attack. It can push through waves of enemies and with a single powerful motion, send them screaming into the life beyond with the power of sheer localised lightning. The Striker takes its fear and its pain and its urge to protect and unleashes it outward in a devastating explosion of power. This grenade has a dual function that any skilled Guardian as well as rookie ones can take advantage of. While having a wonderful amount of damage on the main explosion, any enemies that do take damage from its blast are disoriented for a short time. It comes about in a bright flash of white light that make it almost impossible to counterattack for a short time. This grenade is quite useful in PVP as it can make a lone Guardian and entire groups of close knit Guardians helpless while you pick them off quickly. You might score kills with this grenade but it has a greater effectiveness if you are following your targets after the initial explosion and finishing them off. This grenade, like the name suggests emits a pulse of localised arc power that periodically damages enemies inside its explosive radius. This grenade can be of a great utility in PVP and PVE but it would definitely see more kills against AI enemies rather than player controlled Guardians. This is because it is quite easy to avoid and does not deal a huge amount of damage in a short time. However you still can get kills in the Crucible with it against Guardians who are not paying attention or those who have already taken damage from another source. The Pulse Grenade is more of a PVE addition due to its ability to easily clear out adds in a short space of time. It is, essentially a set and forget grenade. The Lightning Grenade can stick to any surface, whether it be floor, ceiling or wall and periodically emit a focused blast of lightning away from the surface it has attached to. This grenade is devastating in both PVP and PVE. It requires specific placement in order to get kills but use this grenade correctly and those kills will flood in. As soon as it sticks to a given surface it emits its first bolt of lightning and with a short time between bursts it can take out most Guardians within two to three pulses depending on their health. It can be utilised to shut down locations such as hallways and doorways due to the devastating output. However, be warned, if you place one of these grenades too close to you, the initial blast of the Lightning Grenade can take you victim, much like the Tripmine Hunter grenade. A drawback to these grenades is that they can be destroyed by shooting the main body of the grenade, that emits the bolts of Lightning. Aftermath : Fist of Havoc leaves a damage dealing field in its wake. This perk allows your Fist of Havoc to deal ever more damage even after the initial ground pound. It serves a great purpose as it can finish off any enemies that are not eliminated by the Fist of Havoc itself and stopping your Titan from being pursued as the pulses Aftermath delivers, deal a large amount of damage, making opposing enemies quite easy targets. 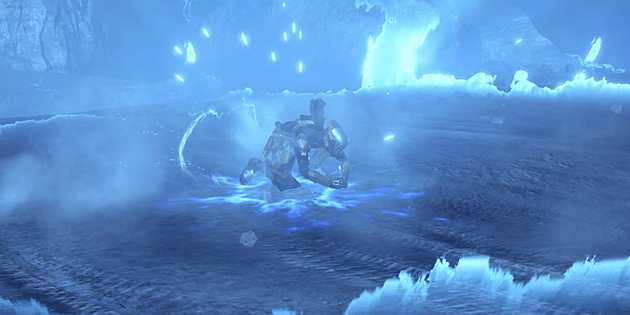 Death From Above : After jumping, Fist of Havoc can be aimed at enemies below. This perk is a fun one in both PVE and PVP as it can turn your close range ground pound into a long range Superman dive. Death From Above can expose any enemies around the map and make them easier targets for your Super. However you must use caution because Death From Above is only as effective as the height you can manage before activating your Super so if you are a metre or so off the ground you may not have as many options for targets. Shockwave : Fist of Havoc unleashes a devastating wave of energy which travels along the ground. Shockwave is an additional attack to the initial circular Fist of Havoc which spreads damage in a relatively narrow field in a straight line in the direct you launched forward with your Super. Imagine a wave of crackling arc energy that fires forward towards any potential enemies. It can be useful for getting an extra kill or two or even dealing enough damage to allow your Guardian to regroup.